Description: Here is page 12 of a 34-page article (in five installments) entitled "Locomotives Of the Pennsylvania." 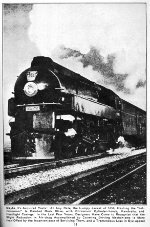 It was published originally in the August 1941 issue of "Railroad" magazine, page 51. Shown here pulling "The Jeffersonian" is PRR engine #5338, a K-4S (4-6-2) "Pacific" built in Juniata during March of 1918, streamlined in 1941, and retired in October of 1955 after 37 years of faithful service. Description: Here is page 30 of a 40-page booklet published by Harry P. Albrecht entitled "A Picture Study Of The K-4." First issued in October 1967, revised in September 1976. Section Caption: "Some Modifications." Both of the locomotives pictured here are Pennsylvania Railroad K-4S (4-6-2) "Pacifics" built in Juniata. Top Photo: #5338 was built during March of 1918, streamlined in 1941, and retired in October of 1955. Bottom Photo: #3678 was built during April of 1918, streamlined in 1941, and retired in 1957.